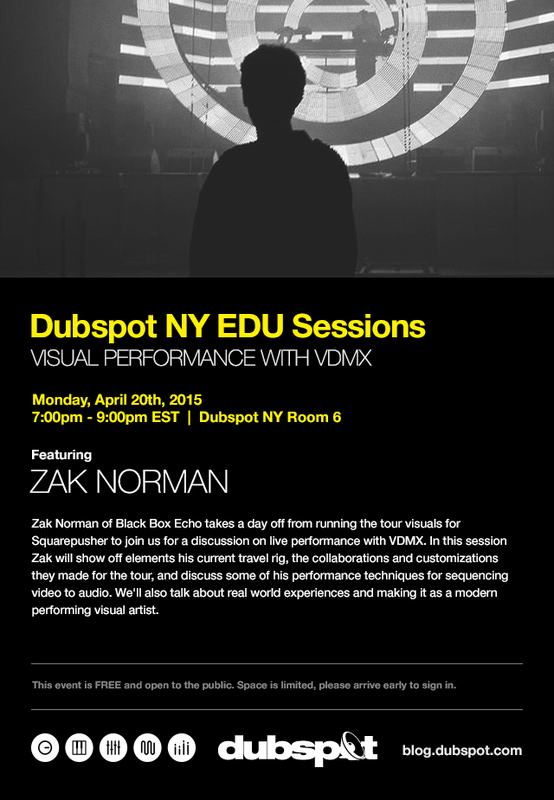 On Mondray April 20th, join Zak Norman of Black Box Echo for a free Dubspot NY EDU Sessions workshop on using VDMX for live performances. Zak Norman of Black Box Echo takes a day off from running the tour visuals for Squarepusher to join us for a discussion on live performance with VDMX. In this session Zak will show off elements his current travel rig, the collaborations and customizations they made for the tour, and discuss some of his performance techniques for sequencing video to audio. We’ll also talk about real world experiences and making it as a modern performing visual artist. Our aim is to create systems that interact with the way the artist chooses to create their art. We work closely with our artists in order to create environments where the music and lighting work as one, rather than competing against each other for the audience’s attention. The result is an organic, music led experience which gives artists more flexibility to adapt their setup on the fly, even during a show; giving more freedom to interact with the audience naturally, whilst still keeping a synced audio visual show. Our content vision is based heavilly around narrative – we like to tell stories, and for those stories to have a deeper meaning than just a collection of pretty pictures. Through generative visual advancements, we can let the music do the talking and give the artist or user control of moving forward the story and choosing how deep the rabbit hole goes. David Lublin is a coder, technical support guru, and occasional artist. One of the brains behind VDMX video mixing software at VIDVOX, as a programmer he focuses on making tools for other artists to express themselves visually. Creative interests lie within the interaction between the worlds of art, science and the general absurdity of human life. VDMX is one of tne of the most popular VJ software for the Mac platform. With it’s ability to mix any number of input clips and up to 4 external video input sources, VDMX comes fully-loaded with all the bells and whistles that are customarily expected from a professional VJ package.